When it comes to audio devices, you know for sure (your ears probably won’t be able to fool you) when you see the logo “JBL” emblazoned across, that quality will be there. I guess that is the case for most, as I am quite sure that there will be a group of you out there who will disagree. Well, one of JBL’s latest releases would be the JBL OnBeat Air – a device that is said to deliver incredible sound over the wireless technology from Apple known as Airplay, letting you stream your favorite tunes via your laptop, iPhone or iPad. Needless to say, being wireless does not mean it will work throughout your home, unless you live in a small one-bedroom studio. There will definitely be blind spots around, but generally speaking, a room by itself would do just fine, and that is where most folks would confine the use of the OnBeat Air to anyways. As for audio quality, you can be sure that this versatile music player will feature digital sound processing equalization, sporting dual Phoenix full-range transducers that roll out a room-filling soundscape. 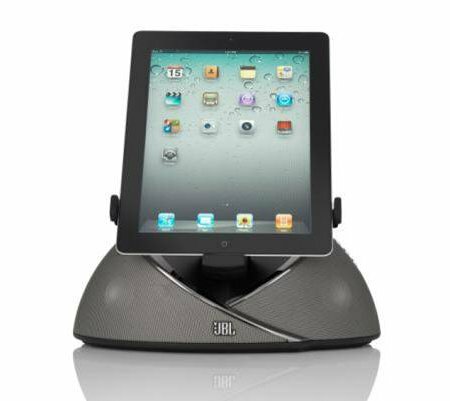 Retailing for $249.95 a pop, the JBL OnBeat Air will also come with an adaptable docking station that is able to fit an iPad, iPhone or iPod in either portrait or landscape mode. If you prefer not to drain more battery from your device via a wireless connection, there is always the option to take the 30-pin dock connector route. As for those who do not rock to iOS-powered devices, you can always hook it up to the OnBeat Air via Wi-Fi or the built-in auxiliary input jack. Yes sir, this means Android smartphone owners need not worry and can still get one of these for themselves. Aprat from that, the OnBeat Air will also come with an IR remote control which allows you to quickly navigate iTunes songs, playlists and videos. Alternatively, this can be a great videoconference tool if you use Apple’s FaceTime or take advantage of Skype. Are you looking for a speaker dock for your smartphone? The JBL OnBeat Air seems to be a decent enough addition to any room. Agree, JBL is the real deal when it comes to true sound.. Still got my old but still awesome sounding JBL speaker. Need the latest model though for my iPad..